The Darksiders games have always had the unusual place of being far better than they had any right to be. For all its larger-than-life heavy metal aesthetics (HUGE shoulder pads! ), the first game in the series was one of the better Zelda-like action adventures of its time, and still looks great thanks to a recent HD update. The sequel made combat faster and introduced more action-RPG elements, shifting the genre more towards hack n’ slash combat with high-agility maneuvering, but never to the detriment of the overall design. It looks like the third might well be living up to that legacy, thanks to a little bit of gameplay footage released just before 2017 comes to a close. 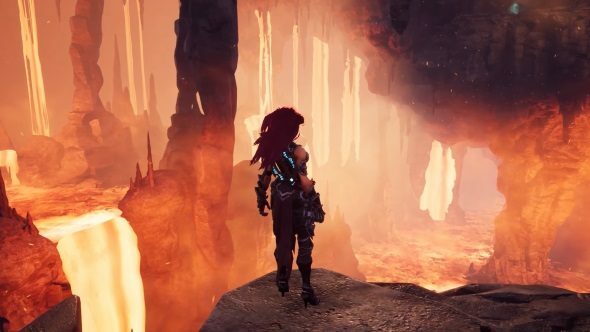 Darksiders 3 made our list of games to get excited about for 2018. It’s among some impressive company, too. Go check it out! Yep, that’s Darksiders alright. Despite the next-gen spit and polish the game has clearly received (those are some lovely lighting effects, and the incidental scenery gubbins are very detailed), everything from the pace of movement to the enemies remains familiar, even when new elements are introduced, such as Fury’s versatile flaming chain-whip doubling as a grappling hook for traversal purposes. The footage makes it clear that while there may be some superficial design elements shared, Fury is not Bayonetta. She’s slower, more calculating, more like a cross between God of War’s Kratos and War from the original Darksiders. The majority of her attacks in the video are shown to be sweeping, heavy and high-impact, making it seem like it could be easy to over-commit to an attack if you get greedy. One thing Fury does have in common with our favorite Umbran witch is an acrobatic dodge move with what looks to be a generous number of invulnerability frames, allowing you to evade damage altogether if you’re bold enough to dodge into oncoming attacks at just the right moment. It’s a personal favorite combat mechanic of mine, and one easily adopted from a great many other games. As a playable character, Fury does seem to play a middleweight role somewhere in-between Death and War (now there’s a sentence and a half). Not quite as combo-happy as her hunchbacked, mopey co-worker, but a little more mobile than her chunky, up-armored predecessor. So long as the campaign structure of the game remains compelling, I can see this one being a solid pick for action-adventure fans next year. Darksiders 3 has no firm release date at present, with THQ Nordic only giving a broad ‘2018’ target, but we’ll be sure to keep you posted of any exciting developments from the world of Darksiders. Plus, you can wishlist the game on Steam now, just in case they try to sneak the game out without telling anyone.